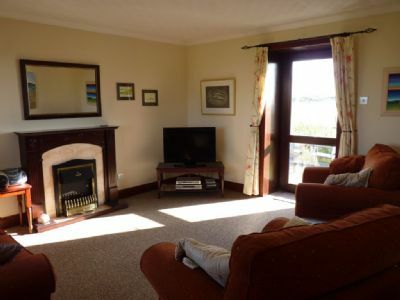 As the name suggests this is the larger of our three cottages with a nice spacious lounge, eat in kitchen, shower room, one double bedroom with king size bed and a second bedroom that has two single beds. The kitchen is fully equipped with large fridge freezer, dishwasher, washing machine and a good selection of cooking utensils. There is space to dine in the kitchen with lovely views over the surrounding farmland to the rear. The spacious lounge has comfortable seating, along with an attractive fireplace. From the lounge you can access the rear garden with seating area and patio furniture. This is an ideal spot to sit and watch the sun go down with a 'refreshment'. In the height of the season you will often hear the corncrakes calling as the farmland to the rear is a designated corncrake site and is managed to encourage these rare and unusual birds. 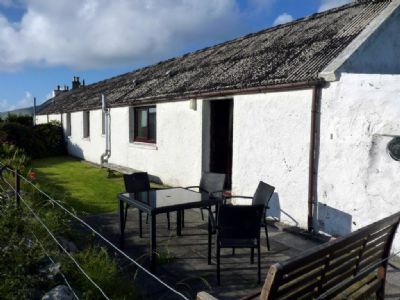 The large bathroom has an electric shower and lots of space (there is no bath in this property - water supplies on Tiree are such that showers are much more efficient in terms of fresh water useage). The main bedroom has a large king size bed and ample storage/hanging space for clothes. The second bedroom is a good size with two single beds and ample storage space. The property is centrally heated (night storage) and there is an electric fire in the lounge if additional heating is required. Due to the mild climate heating is only really required early/late in the season to take the chill off. There is free wireless internet within the cottage and guests are welcome to use this.